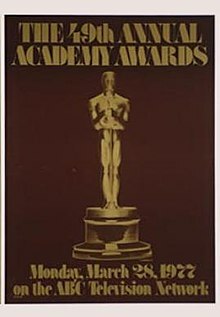 The 49th Academy Awards were presented Monday, March 28, 1977, at the Dorothy Chandler Pavilion in Los Angeles, California. The ceremonies were presided over by Richard Pryor, Ellen Burstyn, Jane Fonda, and Warren Beatty. This Academy Awards ceremony is notable for Peter Finch becoming the first posthumous winner of an Oscar for acting, a feat matched only by fellow Australian Heath Ledger 32 years later; Finch had suffered a fatal heart attack in mid-January. Beatrice Straight set another record by becoming the actor with the shortest performance ever in a film to win an acting Oscar, with only five minutes and two seconds of screen-time in Network. Network, along with All the President's Men, were the two biggest champs of the ceremony with four Oscars each, but Best Picture and Best Director ultimately went to Rocky. Piper Laurie was nominated for Best Supporting Actress for Carrie (1976), her first role since her Best Actress-nominated performance in The Hustler (1961), thus being nominated for two consecutive roles, fifteen years apart. 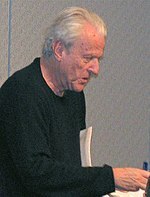 Network became the second film (after A Streetcar Named Desire) to win three acting Oscars, and the last, as of the 90th Academy Awards, to receive five acting nominations. It was also the eleventh of fifteen films (to date) to receive nominations in all four acting categories. This year's Academy Awards is also notable for the first ever female nominee for Best Director, Lina Wertmüller for Seven Beauties. Barbra Streisand received her second Academy Award, composing music for the love theme "Evergreen", the first woman to be honored as a composer, and as of the 90th Academy Awards, the only person to win Academy Awards for both acting and songwriting. No honorary awards were given this year. ABC had the Oscars from 1960–70 and had regained them for 1976. For the second straight year, the ceremony was scheduled directly opposite the NCAA championship basketball game on NBC, won by Marquette in Al McGuire's final game as head coach. ^ "The Official Academy Awards® Database". Archived from the original on 2014-06-09. Retrieved 2011-06-27. ^ "The 49th Academy Awards (1977) Nominees and Winners". oscars.org. Archived from the original on 2015-01-11. Retrieved 2011-10-03.